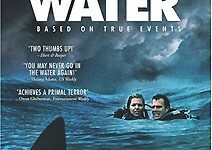 Based on true events, "Open Water" follows an American couple, Daniel and Susan, (Travis and Ryan) on an island holiday. Upon arrival at their hotel, we learn that Daniel and Susan's relationship is under strain from their workaholic lifestyles, and they need a vacation even more than they realized. The next morning, the loving and rested couple, certified scuba divers, board a local dive boat for an underwater tour of the reef. The boat is crowded with other vacationers, and due to a series of innocent miscommunications and a distracted crew, the couple is, after only 40 minutes or so underwater, accidentally left behind. What follows is the story of their ordeal: cold, alone and miles from land, the couple is adrift in shark-infested waters.